BT Tactical Vests are designed with paintball players in mind. Utilizing lightweight, breathable materials and a modular design, BT Tactical Vests are highly maneuverable and allow for a multitude of upgrades. 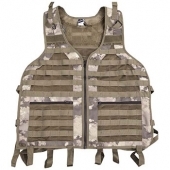 BT Tactical Vests come in a number of designs giving you the choice between full coverage, highly protective vests or lightweight high speed vests. Tested and proven on paintball fields world wide BT Tactical Vests are a great choice for any paintball player looking to take their game to the next level! BT Tactical Vests There are 2 products.